Over two years ago my son, Kenya, got sick. For almost 6 months straight he complained of headaches, stomach aches and nausea. For a mother this is your daily nightmare. After spending months reading books and visiting holistic and western doctors I took a step back at what was going in his body. Kenya chose to become a vegetarian when he was 6 years old and I’ve always tried to be supportive of that decision. Although he loves a variety of fruits and vegetables, I slowly watched him start gravitating towards bread and cheese at every meal instead of animal proteins. Over time I started to realize that for a little growing body this couldn’t be good for his body or brain. 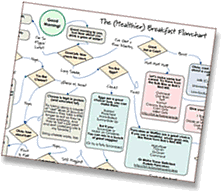 One night I created a chart with different categories including fruit, vegetable, protein and plenty of “extras” that he could choose from giving him the power of choice over what went in his body. Within 2 weeks all of the symptoms that were making him feel lousy had all but disappeared. The shift in his health was incredible to see and two years later he still knows he has to have his smoothie every morning to feel his best. Looking back I realize I was part of the problem, not him. I was making pancakes, waffles, crepes and other heavy starchy foods first thing in the morning instead of offering the foods he really needed. For his little system it was like poison weighing him down and making him feel lethargic. From that point on everyone in our family, even our baby, Gemma, started drinking a smoothie every morning and we’ve never looked back. One of the easiest ways to start your day with a bang is downing a tall smoothie packed with nutrition. I’m not talking just strawberries and milk, I mean tons of vegetable, fruits, nuts, seeds, fats, and more that’s not only easy to digest, but also energizing. 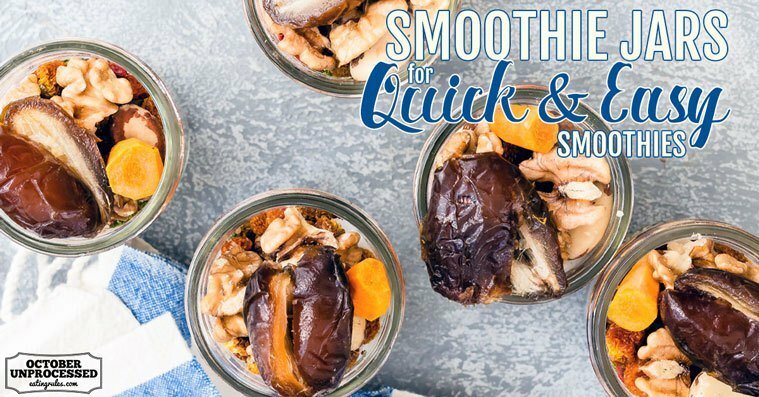 When you’re in a hurry in the morning, though, it can be daunting trying to get everything ready for your smoothie, so I started making Smoothie Jars to streamline the process. Into them I add everything from dates, hemp and chia seeds, goji berries, coconut oil, walnuts, cocoa powder and more! 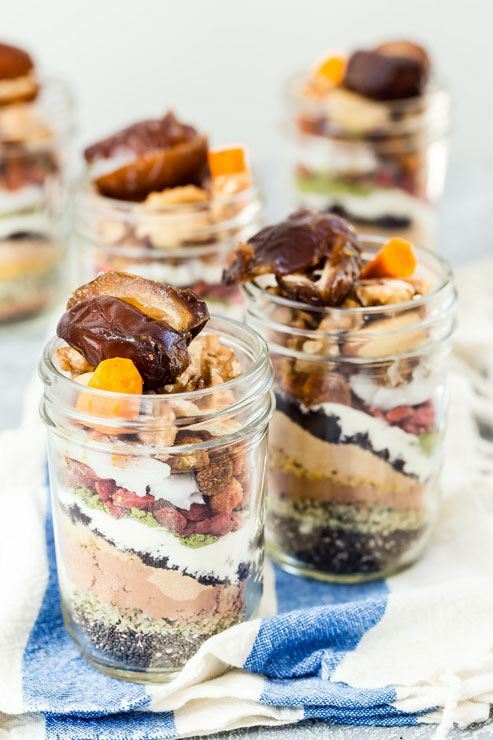 It’s totally up to you what goes inside, but they can last in your fridge for weeks, so all you need to do is pull one out, add whatever fruits, veggies, yogurt or kefir and milk you have on hand and you have a drink that’s so delicious and nutrient dense. If you have any favorite add ins or smoothie combos I would love to know! Just leave them in the comments as inspiration for all of us. 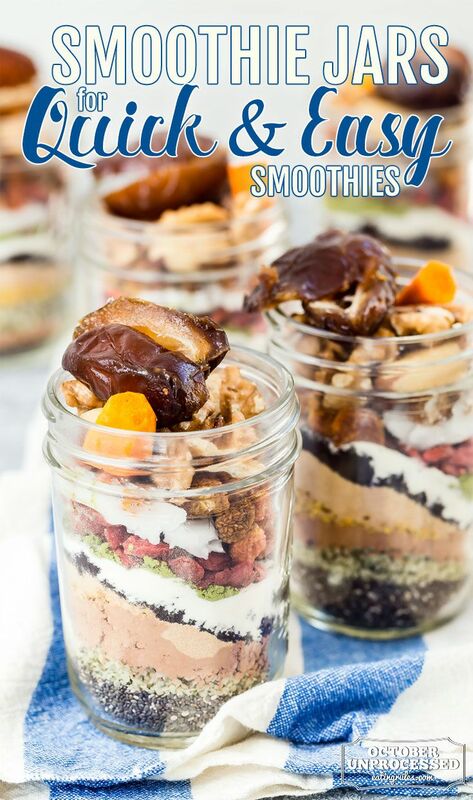 When you’re in a hurry in the morning, it can be daunting trying to get everything ready for your smoothie, so make Smoothie Jars to streamline the process! In a mason jar, layer the powders, then top with the remaining ingredients. Store in the refrigerator up to 7 Days. When ready, pour the jar contents into a blender along with your favorite milk. Blend until smooth. Catherine McCord, mom to Kenya, Chloe, and Gemma, launched Weelicious in 2007 as a platform to show parents around the world how easy and beneficial it is to expose children to wholesome, delicious food. 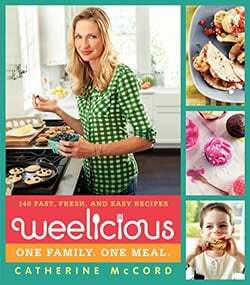 Weelicious has grown with its community, and is now home to over 1,500 original, family-friendly recipes and weekly how-to videos. In 2016, Catherine launched One Potato, the first organic home meal delivery kit focused specifically on the mealtime needs of families. Currently servicing California, Nevada, Colorado and Utah, One Potato recently expanded into a brand new kitchen and warehouse facility with the goal of being nationwide in 2017. Catherine is also the author of two cookbooks – Weelicious: One Family. One Meal. and Weelicious Lunches: Think Outside the Lunchbox. You can also find her on Facebook and Instagram.